When I turn the ignition on, my oil pressure gauge goes to about 90%. When the car is started it goes to maximum. A new pressure sensor was fitted in 2017. I’m sure this isn’t how it should read, any ideas what is wrong? Either the new sender is knackered, the wire from the gauge to the sender is grounded somewhere or possibly the instrument voltage regulator has died. However I am not sure if the V12 has the oil gauge powered from the regulator... Check your wiring diagram....and if it is ife expect the fuel gauge to be misbehaving too if it is the instrument voltage regulator. Five gets you ten it's the oil pressure sender. The reproduction ones are well known for being crap. Having checked the diagram the oil pressure gauge is not fed from the instrument regulator so either the wire from the gauge to the sender is grounding somewhere or most likely the sender is dud. The gauge is rarely faulty. Last edited by cactusman on Sun Sep 23, 2018 8:19 pm, edited 1 time in total. Hello ! This subject has been discussed in the past. Common problem, no worries. Call a Smiths dealer an order the mechanical gauge/set-up. Fairly easy install, and ,once warm, you will get spot on pressure readings. Gauge different, but can't tell...looks stock. FYI: rule of thumb....once warm, you get 10 lbs of pressure for every 1000 rpm's. No more, no less. Folks stating they get 40 lbs, etc, at 2000 rpm's, etc, probably still using electric gauge.. Its just junk....get the Smith's mechanical. They even provide the flexible, hi-strength oil line which makes the install so easy. You will love it. Best of luck. Thanks for the responses. I’ve had look at the wiring and nothing is obvious. The new oil pressure sensor was installed when the engine was out of the car and now I’m trying to figure out how to get a hand to it to check the terminals. Which is the easiest route to it? Do I take off the exhaust system? Once again, easy solution to your problem....few simple steps. 2. Remove electric oil sender. 3. Place electric sending unit in nearest garbage container. 4. Get hold of Smiths mechanical gauge and sending unit with kit. 5. If your my age, time for a bathroom break. 6. Install Smiths gauge and sending unit. 8. Enjoy your V12 E knowing your exact oil pressure at all times. I’ve just recently swooped my nonfunctional oil sender for a new SNG one. It seems on the earlier V12 the sender is very inaccessible, later it was moved to the top of the engine. Raise car, remove front wheel, remove the splash guard in front of the vacuum bottle. Not easy but you can now reach in to remove the wire from the sender. I now used a crow foot to go on to the sender and an extension bar + a UJ + second extension bar to my ratchet drive. 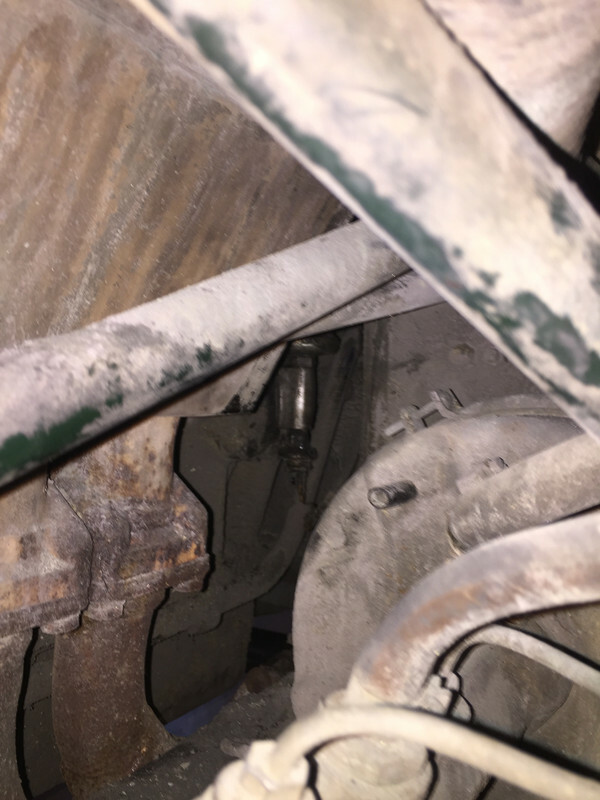 The extension bar threaded through between the exhaust down pipe and the engine frame allowing me to turn the ratchet below the sump. All in all not easy but it worked for me. When re-commissioning a friend's car, we purchased a new sender AND gauge from the co now representing Smiths. The sender I received looked correct physically, but it was a mismatch against the gauge. It turned out the Gauge was wrong. The second shipment they sent was correct. I'm saying that perhaps the new sender or the gauge you have, is also not the correct unit. Yes, we know that mechanical/capillary gauges are more accurate and reliable but that is not answering the question asked. Spot on.....the "wet gauge" simply taps into the oil system via a brass fitting on the top of the block on later V12's . What you see on your dash mounted Smiths gauge is exactly whats going on , real pressure reading in real time. Only way to fly. I'm lucky in the sense that my original gauge and replacement sender has worked for 8 years now. As back up, I mounted a motorcycle pressure gauge that plumbs directly into where the electric sender sits (with a few adapter bits). Both read the same. Can somebody (anybody) provide a one-stop-shopping website where I can find the Smiths mechanical oil gauge and sender (preferably for a Series III E-Type)? 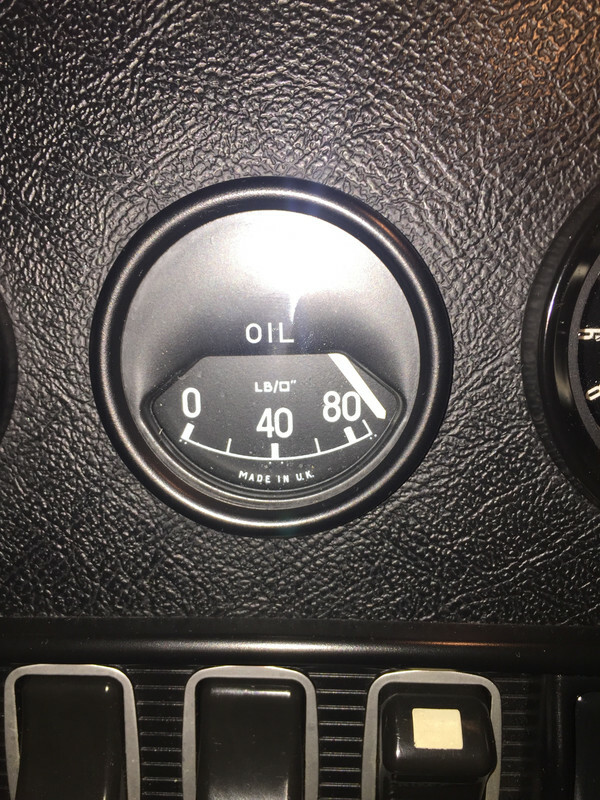 I have the stock gauge in the dash and two spare gauges: one 0-60 sq in and the other 0-100 sq in that can be converted to mechanical (or more accurately using the gauge face with modern/updated innards). I have searched 5-6 sites to no avail. I seem to recall one of the Jaguar clubs offering mechanical gauges/senders to club members -- is that still an option? who and where? You could email/call them and see if they offer a S3 version. Try and avoid the steel braided hose version as you have to insulate it with shrink wrap - the standard plastic hose is easier to deal with. Thanx for the recommendation. I took it one step further and reached out to two outfits. 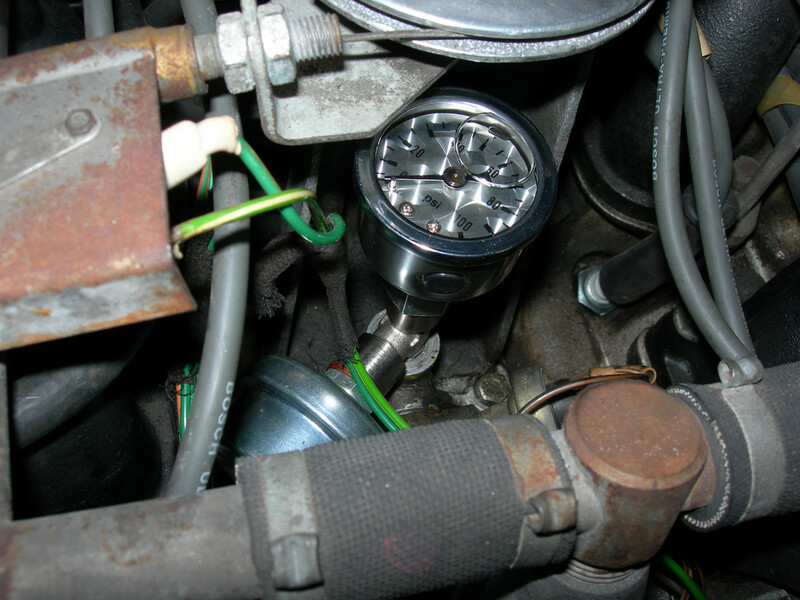 For the Series III guys, here are two options for upgrading to a mechanical oil pressure gauge. "This gauge was made for an E-Type S1/S2 car so the bezel is correct for those models. 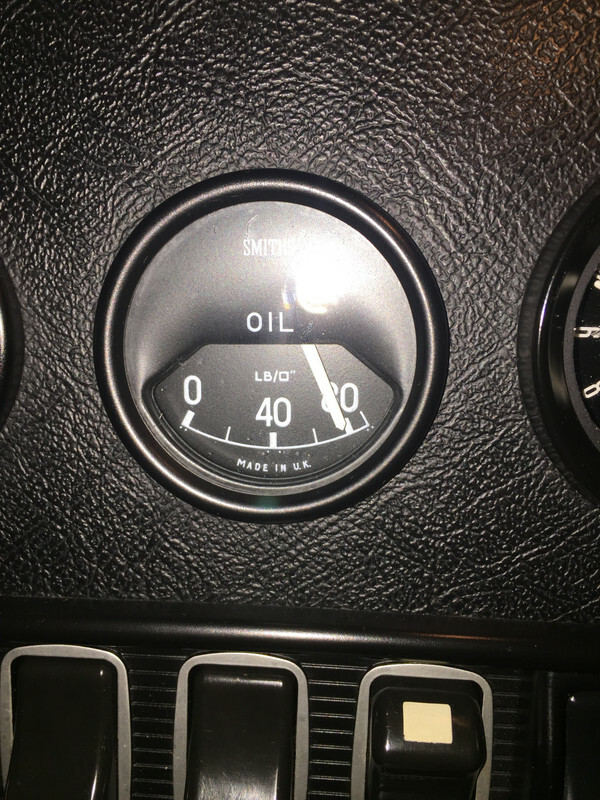 You can use this on a V12 model, however, the bezel will not match the ones on your other gauges but you can swap this from your existing gauge to the new gauge if you wish for them to match. If you require any further information, please do not hesitate to contact." "We are currently in the process of producing an e-Type 100 PSI mechanical Oil Press Gauge and should have pricing by mid November 2018, please contact us again at that time." Removing the bezel is easy and I have done it when fitting a voltmeter in place of the ammeter - only takes a couple of minutes to do once the gauge is out. Just reviving this old thread, I am gathering the parts to convert to a mechanical oil pressure gauge. I will need to source an adapter to fit the gauge line to tapping used for the old electrical sender. It looks like a 1/2” fitting but what is the thread type and pitch? I guess it will be a funky old BSP thread or similar. Hi Kevin: You shouldn't have to "gather the parts" in order to switch to a mechanical oil gauge, Just contact an authorized Smiths dealer, and order the kit....you will get everything you need. Could not possibly be any simpler to install. Correct pressure readings forever !! Hi JJ, well partly because I’m just tight and partly because it’s all part of the fun. Gathering the bits has saved me about £125. In case anyone else wants an adapter, you need a 1/4 BSP - 1/8 NPT male ends. On E bay for about £8.